William Frederick Cody, also known as Buffalo Bill, was a legendary buffalo hunter (okay they are actually bison, but Bison Bill just doesn't have the same ring to it), pony express rider, Civil War veteran, civilian scout in Indian territory, ranch hand, wagon train driver, trapper, prospector, and showman. 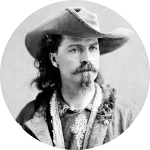 He was a household name in America when he founded Buffalo Bill's Wild West show in 1883. He became an international celebrity after his show repeatedly toured Europe from the late 1880s until the early 20th century. Although Buffalo Bill's known famous kin are not as extensive as other historical figures, he still has a number of well known people he can count as cousins. His family connections to U.S. Presidents include William Howard Taft, Richard Nixon, and Millard Fillmore. Buffalo Bill's kinship to literary greats include poets Ralph Waldo Emerson and Robert Frost, and author Tennessee Williams. More recent connections include astronaut Alan Shepard and movie actor Matt Damon.